When the body of Otzi the Iceman was discovered frozen in the Italian Alps, a window opened, and that window gave us a glimpse of survival EDC (Every Day Carry) in 3200 BCE. It was one more step to understanding that if we want to better master any survival skills, we must roll up our sleeves and learn the basics. Even throwing smaller rocks at larger ones produces usable fragments sharp enough to prepare dinner with or scrape hides, so do not make this more complicated that necessary getting started. 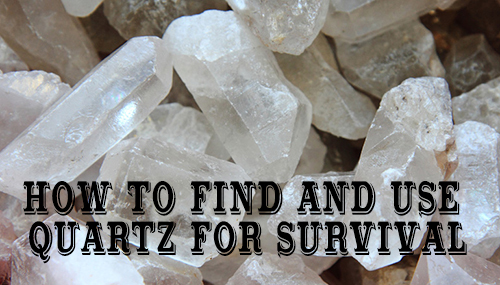 Finding varieties of quartz is not difficult in most of the world. If you find a rock that is common and scratches glass, chances are you are holding some type of quartz. Quartz crystals are like naturally occurring handle drill bits. Set one in a spindle and you are in the primitive hole drilling business. The time to learn flintknapping and other first skills is before you find yourself in a survival situation. Maybe Otzi was one of your ancestors. According to granddaddies of primitive survival like Larry Dean Olsen, Dave Wescott and David Holladay, even if Otzi wasn’t a relative of yours, everyone living today has ancestors who used stone tools. They teach that primitive skills are really “first skills” and are the foundation upon which modern survival skills are built. Just as studying the origins of science gives us powerful insight into everything built on top of them, if we want to understand survival skills, we must roll up our sleeves and learn the basics. Once you can survive with only what the earth provides, you will be that much more effective with modern tools, the resources available to you in built areas or with what others have left behind in the wilderness. Otzi’s equipment tells us a great deal. While he carried a copper axe with a two-foot haft carved from yew and a narrow head, he also carried a knife with a flint blade mounted to an ash handle, an antler tool for flint knapping and arrows tipped with flint, so he had tools of copper and stone. One of the most interesting pieces of gear to me was his fire kit, in which flint also played a role. The extreme hardness of flint enabled Otzi to use his knife to strike iron pyrite in much the same way flint and steel is used to start fires. Here comes the next question: how many uses can quarts have if used for survival? Fire Striker – The extreme hardness of quartz enables it to be used to strike sparks from iron pyrite. Edged Tools – Quartz-based rocks can be worked into a variety of shapes and produce serviceable cutting tools and scrapers. Projectile & Spear Points – Arrows and atlatl (spear thrower) darts penetrate deeper and cause greater blood loss when tipped with projectile points which is crucial for hunting medium and big game and for use against predators or two-legged varmints. Quartz Tipped Hand Drills – Drilling precise holes can be a real chore without modern tools. Hardwood drill bits can be tipped with quartz, quartz crystals or small crushed crystals can be used as an abrasive compound to polish or abrade a hole in any softer material which, in the case of quartz, is most other abundant naturally occurring materials. Hand, bow or pump drills can be used to drive the drill bit. Since quartz in one of the Earth’s most abundant minerals, it is not particularly hard to find. Quartz is composed of silicon dioxide and all silicates are derived from quartz, making up around 12% of the earth’s crust. Quartz is a crystal and crystals are not much good for knapping tools such as knives since they fracture along faces, producing edges that are not sharp enough to work with effectively, but quartz crystals do make effective drill bits. Tools knapped out of quartz crystal are beautiful, but with few exceptions, they are sharp or durable enough to be very useful. For flintknapping tools, more homogeneous rock that can be flaked into very sharp edges is needed. Two cryptocrystalline varieties of quartz that both have wonderful properties for flintknapping are flint and chert. Flint and chert are fine-grained sedimentary rocks composed of cryptocrystalline or microcrystalline silica, so depending on its origin, it can contain microfossils and/or small macrofossils. Flint and chert have a similar, fine-grained appearance and both can vary a great deal in color and both form in nodules. Telling them apart is more relevant to geology than survival since they are both good for the same things, but flint typically has a lighter colored crust around nodules of flint, whereas chert does not. Quartzite can also be suitable. I wouldn’t be caught dead without a zircon ceramic bead on my person that is a wonderful striker for ferro rods or flint and steel and can also shatter tempered glass such as the side and rear windows of cars, but even if I’m turned loose with just the skin on my back, I know I can find a rock to use as a striker. Any rock or mineral of 7 (softer than hardened steel) or harder, on the Mohs Scale of mineral hardness, will serve in the role if striker. The Mohs scale uses a simple test to determine hardness which is that harder materials can visibly scratch softer materials, but the reverse is not true. If you can scratch glass with a rock (which is a, you have your striker. On the Mohs Scale, iron is a 4, steel is 4-4.5, obsidian or volcanic glass is a 5 and manufactured glass is 5.5 and quartz is a 7. Since quartz is harder than steel, it can be used to flake hot sparks from steel. Quartz is the hardest natural material that is easy to find, which gives it great utility. Flint and chert produce sparks reliably enough that they have been used as the mechanism of ignition for the many types of flintlock firearms since at least the fifteenth century. Nodules of chert can often be found embedded in limestone and sandstone. To get at them, you will need to break away the limestone or sandstone using a hammer rock or a large or by dropping the sedimentary rock containing flint or chert nodules on an anvil rock. For flintknapping, the best rock is brittle and uniform in structure with the fewest possible flaws. Since chert and flint are so fine-grained, they are better than crystalline quartz if available. Tap rocks that you think might be suitable with a hard object. Candidates that strike a higher note are typically better material. In a survival situation, you may have to do whatever is necessary to save lives, but if you find chert cores surrounded by flakes and chips, realize that they are part of an archeological site and should be left undisturbed if you are training. In the Southwest Desert, white veins of quartz are often visible in mountainsides and hills, sometimes at a considerable distance, which can save a lot of leg work, so scan hillsides. Veins of quartz may yield crystals or pieces that are more homogenous looking without grains and the fewest possible flaws. They will be milky in color, often milky white and I have found many quartz and chert projectile points, and pressure flakes from the manufacturing process used to make them, hiking the desert Southwest. When you find a rock that produces good pressure flakes or small, controllable chips when struck, as opposed to shattering, you are in business. Quartzite is a metamorphic rock formed from quartz sandstone by exposure to heat and pressure. The surface can be grainy, glassy and speckled by the grains of sand that were fused to make quartzite or may feature elongated crystals that are fused together. Quartzite it very hard and angular. There is quartzite along the Wasatch Front of the Rockies, in the Appalachians, Idaho, Arizona, Wisconsin, Minnesota, South Dakota, South Eastern California and Central Texas. It is a mistake to overly complicate the construction of stone tools when starting out. Making basic stone tools is literally as simple as striking two stones together. If you use the right type of stone, throwing smaller rocks at larger ones produces useable fragments capable of basic tasks like preparing game, processing plants and scraping hides. From this humble starting point, you can begin improving your technique, but that is all you need to get started surviving. Putting an eye in a bone needle or fishhook, creating a divot in a bearing block or hearth board for a fire kit, putting a hole in a seashell, an antler button or piece of turtle shell are all examples of challenges faced in primitive tool making. A quartz crystal-tipped hand drill is an effective tool for any of these tasks and is capable of drilling neat holes. Constructing this tool is very simple with the right shape of quartz crystal. Just construct a suitable spindle and sand the business end flat on a rock. Drill a socket in to the flat face of the tip of the spindle by hand using the crystal. Fire harden the spindle. Then glue the crystal in place using the best glue available. If you have hide available, hide glue will work best. If you do not have easy access to materials for hide glue, pitch will due in a pinch. Flintknapping is the art of making flaked or chipped stone tools. The key is to control the way rocks break when struck or pressure flaked. Modern flintknapping was largely researched and revived by a man named Larry Dean Olsen back in the 60’s and 70’s. Olsen divided stonework techniques into: pressure flaking, percussion flaking, pecking or crumbling and abrading. I recommend you read Mr. Olsen’s book titled, Outdoor Survival Skills and tap into the primitive skills community before you learn pressure flaking. Since the scope of this article is limited to quartz, percussion flaking is most effective to produce flakes and blanks from quartz which are then refined through pressure flaking. Flint, chert and quartzite are varieties of quartz that can be suitable for flintknapping. With glassy rocks, such as jasper (a gemstone variety of a type of quartz called chalcedony with a hardness of 6.5-7) and obsidian, percussion flaking using a punch and hammerstone is effective. With flint and chert, pressure flaking is effective. I recommend sticking to the very basics and breaking smaller rocks on larger ones to produce the few cutting tools you need to feed yourself if you are out so long it becomes necessary unless you are already an experienced flintknapper. I will list flintknapping tools and their purposes, which will teach you much of what you need to get started training, but you are not going to learn what you need to know in one article. Core – A nodule or rock suitable for flintknapping and too large to be suitable as a blank. Flake – Flakes are smaller convex pieces of stone knocked or flaked off larger cores or blanks with a hammerstone. Blank – A flake being worked into a tool. Hammerstone – A hammerstone, antler baton (strike with area where the antler joined the skull) or billet (dense cylindrical stone) used in percussion flaking. A good hammerstone is a dense round stone that fits your hand. Anvil Stone – A larger dense, but softer stone, upon which the stone to be worked is placed and worked. Punch – The tip of an antler with a flat base that is struck with a hammerstone to produce percussion flakes. Limestone or Sandstone Slab – Used for abrading and grinding stones softer than quartz. Pressure Flaker – An antler tool used to pressure flake stone, typically approximately a foot in length. Alternately, a piece of bone or tooth can be socketed into a wooden handle. A pressure flaker should have a chisel-shaped point to secure purchase on the stone blank. Fine-Tipped Pressure Flaker – A fine tipped pressure flaker for precise flaking such as the notches on projectile points where they will be lashed to the shaft of the projectile. Pad – A pad of leather, bark, moss or similar material used in conjunction with a pressure flaker. The pad protects the palm, heel of the hand and fingers from the stone being worked. Protective Equipment – Flakes can be surprisingly sharp, so gloves and hide or similar material to protect your hands and legs is needed. I also recommend wearing eye protection. You should also work in a well-ventilated area.